Ronan Chiefs’ Hunter Peterson takes down a Columbia Falls opponent during Western Montana Duals at the Ronan Event Center Jan. 7. Peterson won an individual title during the Ted Kato Invitational in Thompson Falls on Saturday. THOMPSON FALLS – The Ronan Chiefs wrestling team took home the team championship on Saturday during the Ted Kato Invitational with a score of 186 points. For the Chiefs, Zane Walchuk (103), Owen Brown (120) and Hunter Peterson (126) won individual championship titles. Spencer Stagg (113), Wesley Pablo (182) and Ethan Christopher (285) placed second. Placing third were Cade Rhine (103), Noah Cheff (132), Tyler Houle (160), Justin May (182) and Sam Mocabee (285). Sheadyn Croft (103), Seth Cheff (145) and Landon Lynch (205) were the fourth-place finishers for the Chiefs. Mission/Charlo Bulldogs placed ninth with 72 points and the Arlee Warriors placed twelfth with 20 points in the team standings. Gus Bosley (182) was the lone individual champion for the Bulldogs. Bosley won his championship match by pin over Chiefs’ Wesley Pablo in 15 seconds. Bulldogs’ Robert Dempsey (103) placed second and Warriors TJ Knoll (152) placed fourth. 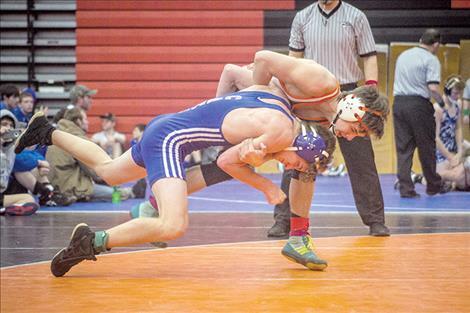 On Friday and Saturday, the Polson Pirate wrestling team competed at the Class A Duals wrestling tournament in Belgrade. In Friday’s action, the Pirates lost to Lewistown 49-24, Glendive 54-16 and Corvallis 39-33. The Pirates did notch a win against Livingston 45- 30.